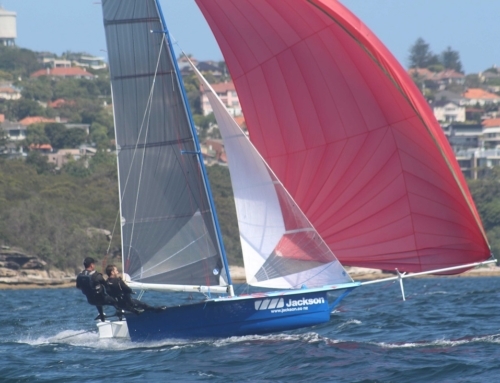 The 12′ Skiff Interdominions continued today with two races scheduled and two raced completed. Proud Kiwis, Alex Vallings and Fraser Brown (C-Tech), came out punching in the first race and secured their fourth bullet of the series. This is their fourth interdoms together and they won in the event in Wellington two years ago. “You wouldn’t have guessed we were going to get four guns in a row. We’ve have had an amazing start,” said Brown. As C-Tech led at every mark in race four, the race for second was on. At the bottom gate for the second time and in second place, Sydney Sailmakers capsized on the spinnaker drop. Behind them was the Kiwi boat One and In who were unable to avoid the sprawling mess and capsized right on top of them. Drama. 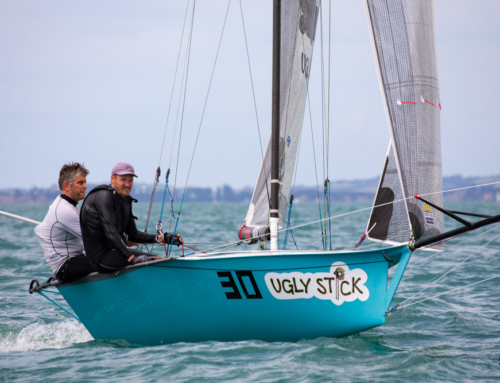 Unfortunately for Sydney Sailmakers, their mistake cost them quite a few places but they worked their way back into fourth. Prior to the start of race four, the fleet once again had to make some big decisions. The wind was right on the cross over between rigs. With back to back races, the right or wrong call could alter the day. C-Tech opted for the number 2 rig and although it paid off in race four, it would hold them back in race five. After their third win, C-Tech headed back to shore for a wardrobe change with a handful of Aussie entrants. This decision to change their rig potentially altered the outcome of the race. C-Tech was 39 seconds late for the start of race five and thus ended their winning streak. It was time for Ugly Stick to shine! Simon Ganley and Oliver Scott Mackie secured the win in race five putting a big cheeky smile cross both their faces. “We had the right rig call from the start. Big rig all the way! Alway go BIG!” cheered Ganley. Now it’s time for the sailors to let their hair down and venture off into the Auckland disco scene for tomorrow, Wednesday 6th January, is a lay day. Racing continues on Thursday 7th January at 1400 hours.